Official Facebook Live videos of GUNS N' ROSES performing in Monterrey, Mexico (November 3); Manila, Philippines (November 11); and Kuala Lumpur, Malaysia during the fall 2018 leg of the band's "Not In This Lifetime" tour can be seen below. Since the "Not In This Lifetime" kickoff in 2016, GUNS N' ROSES has performed an astounding 140-plus shows for over five million fans to date in stadiums, arenas, and as part of festivals worldwide. This year alone the band has played at 13 stadiums as part of their epic run along with five summer festival headlining slots across Europe. The European dates in 2018 have thrilled over 750,000 fans. Produced and promoted by Live Nation, the outing featuring one of the most legendary bands has become one of the most successful tours of all time. 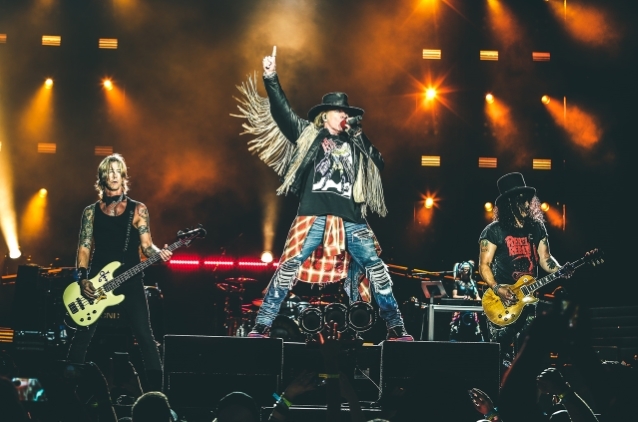 GUNS N' ROSES will rock the paradise city of Honolulu on its only U.S. date of 2018 — and its first show ever to take place in the state of Hawaii. One of the most ambitious tours in rock and roll history will play for thousands of fans at Aloha Stadium on Saturday, December 8. Welcome To The F'n Jungle Monterrey!